Go fishing on the Holidays! 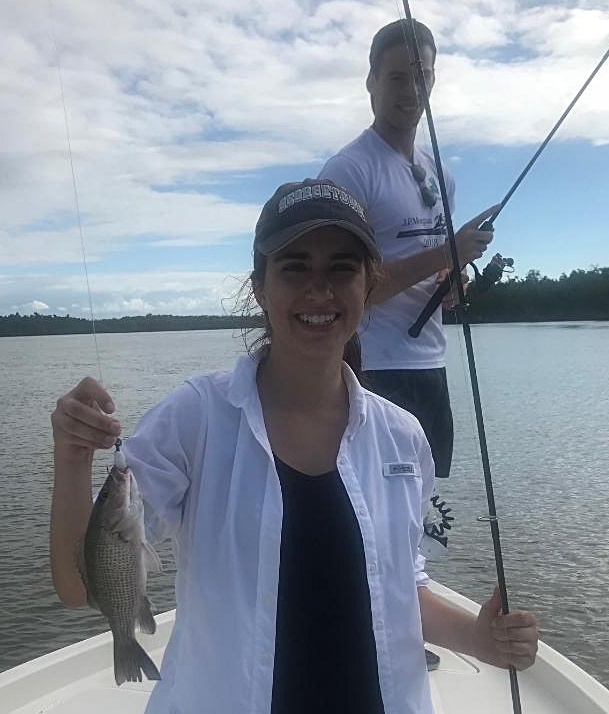 The fun fishing days are here whether in Biscayne Bay or down at Flamingo. The Mutton Snappers in and around the channels of Stiltsville and south have been steady. The numbers out weigh the size but the average size is between 15-19 inches and they really fight in1-3 feet of water. There are Grouper, giant Yellow Jacks, Cuda,s and of course Sharks. The Spinner Sharks are probably the most fun Shark because of the jumping and spinning acrobatics. Flamingo is always a steady bight bite, when I get people who don't care what they catch but want to stay busy I have my best days. This generally happens hen we have kids on the boat. I fished Flamingo with William Daniell his son Chris and his girlfriend Melindy. Melindy had never fished before so William just wanted here to catch a few fish. The day started off quickly with William landing 3 Tarpon. On our second stop Melindy caught her first fish, a nice Trout. Every one got in on the action catching more Trout, and a Snook. Chris and Melindy were competitive and she was winning early on. We were fishing catching everything out there out in the Gulf of Mexico. The list of species is Snook, Trout, Redfish, 20 or so Jacks, 30 Ladyfish, a Goliath Grouper, 2 Lemon Sharks a 30 lb. small one and one that was easily over 200 pounds. Melindy caught on very quick she was casting like she had done this her whole life and beat the giant Shark in about 40 minutes. William coached her to wind down and lift up and eventually the biggest Lemon Shark I have ever had caught was boat side. This was impressive by a novice angler. 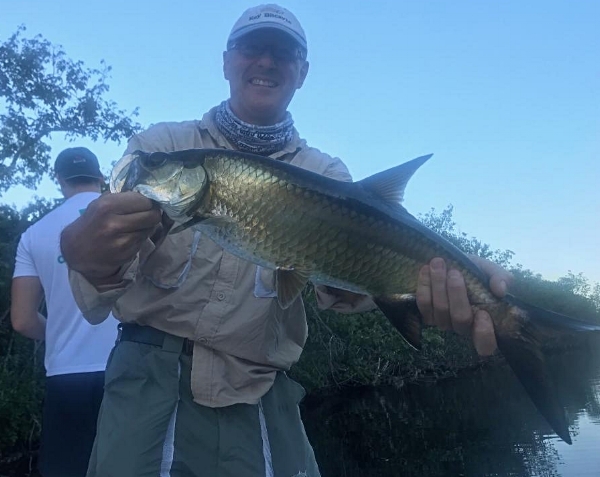 We were fishing live Ladyfish in the Gulf of Mexico and had a few big Tarpon bites, although we didn't catch any. These guys were whipped and we headed in with a happy crew! Fished down at Flamingo with my buddy Paul and his son P.J. It was just a fun fishing day which I use to find new or hot areas. Pau is one of my tournament partners, it helps out because they both can fish and P.J. usually catches the big fish. Today was no different on our first stop he was on instantly. we found some small Snook. He had 3 or 4 before anyone else made a cast. We caught about 20 or so and a couple of really gold Trout. We moved around and every spot seemed to have some small Snook, which is so positive for the next few years. We weren't done we ran back to some of our favorite areas which I haven't been to in more than a year. We hit one of my good spots and it was loaded with Snook we caught another 20 or so and moved on. It was funny because the spots that had fish were loaded and everything else was not. Paul ended up with a good hit which was our biggest of the day @ 32 inches. We found some little Tarpon in 1 foot of water and caught 2 and jumped a few more, this spot was loaded with Snook. We also had 4 Redfish that were small but again great for the future. We agreed on leaving it was 1:30 but we made one last stop. It was crazy the Snook were sitting on the edge of a channel and in 15 minutes we caught at least 30, these were some of the smallest Snook ever. They were between 6” and 15 inches but lots of fun. It was time to go now! The holidays are coming and the kids are off, take them fishing! I am a kid and family friendly charter give me a call at 305 333 8149. Newer Post Flamingo or South Biscayne Bay, You Choose! Older PostSeason starting to Change!